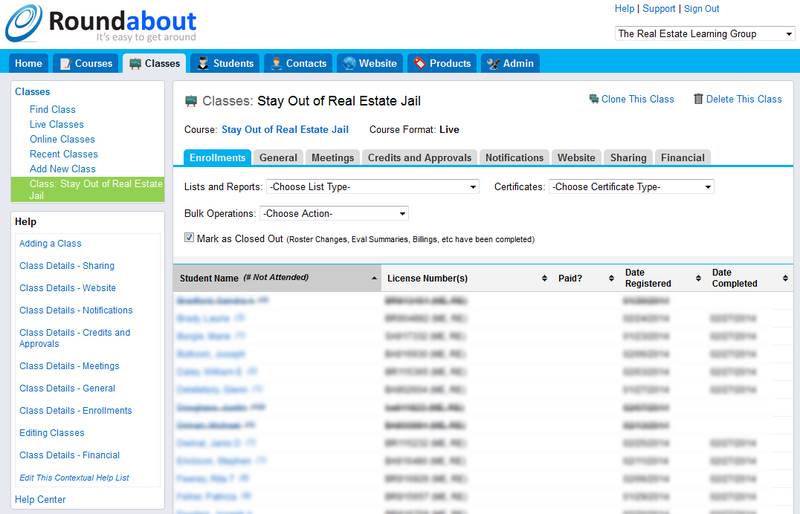 As students enroll in your classes, they're automatically added to a sortable and editable list of enrollments. Want a paper sign-in sheet or a quick list of all of the students in the class? It's as easy as clicking Print. Are you filling out all of your student passing certificates by hand? With Roundabout Education, you don't have to. As part of your customized setup, we'll load the certificates you use so that you can easily print pre-filled certificates for each student enrolled or in bulk for the whole class. If you'd like, they can even be pre-printed with an electronic copy of your signature. Each student's enrollment record can be used to record and store learning records such as whether and when the student completed the class, their final grade, and any other notes you'd like to include. Records are stored for as long as you are a Roundabout Education licensee, and you are free to export your records at any time. At any time, students have the ability to log into their Student Center to view their own learning records and, at your option, print copies of proof of completion and/or passing certificates.